There are beautiful spots worthy of holding onto forever on Instagram and other social networks, everywhere. However, it’s as though Mallorca was created exclusively to show off photos on social media. Why? Well, because in just a few days, this island will allow you to take photos of some of its very diverse characteristics: the best coves, stunning mountainous areas, picture perfect towns, water sports, cycle routs, unique caves and for you foodies, the best gastronomic snapshots. This means it’s possible to put together a collage which will delight your followers on Instagram. We suggest a route around the most instagrammable spots on the island. It’s a little guide that will help you create your best photo montage. It’s just a suggestion, but it wouldn’t be a bad idea to start taking photos of some of the recognisable and most emblematic spots in Palma, such as its incredible cathedral, the streets and corners in the Jewish quarter, the promenade or the Lonja neighbourhood. You can’t miss out on the Es Baluard museum of contemporary art, either. Cala Agulla, Es Guyó, Son Real, Coll Baix, L’Estrella…the list just goes on. Mallorca’s beaches and coves with their turquoise water and incredible sunsets won’t leave anyone indifferent. And of course, they’re landscapes which are just asking to be saved forever on your Instagram account. If you’ve got the right equipment, you can take some dreamy underwater photos. You can’t miss out on a visit to Playa de Muro and Playa de Alcudia, two of the best beaches on the island. The Playa de Muro will win you over with its white sand and exceptional clear water. Taking a photo of yourself on this beach will make anyone jealous. On the other hand, the stunning Playa de Alcudia is almost 3.5km long and recognised as a blue flag beach. It’s perfect for all types of water sports. We’d recommend you take a photo in a kayak on its calm waters. As it’s both clear and calm, the water in Mallorca is perfect for snorkelling, diving or paddle surfing. This means you’ll be able to take photos or make a dynamic and exciting short video which shows your adventurous side. 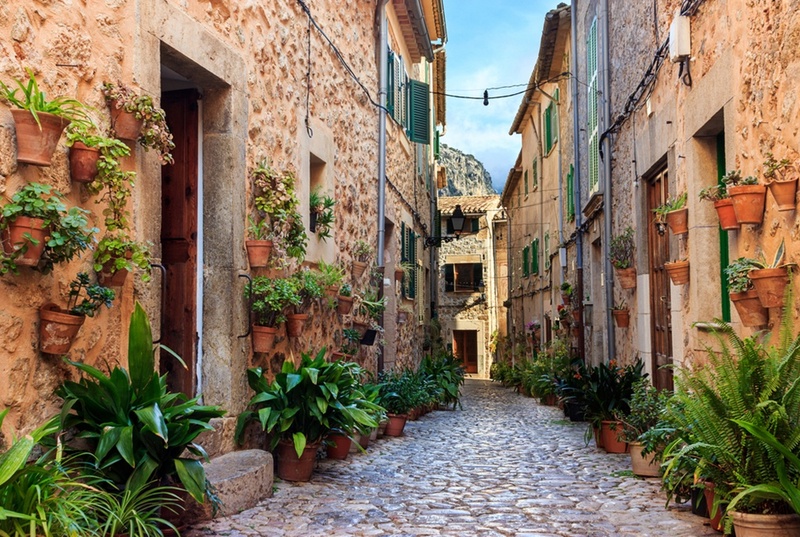 Valldemossa, Pollença or Andraxt are some of the towns with exceptional heritage, genuine contemporary legends of the Mallorcan traditions, going back to its Roman past and even earlier. We’d recommend you capture details such as the cobbled streets, the archway of a façade or the picture window in one of the chapels, for example. We can’t forget about the fantastic town of Capdepera, located very close to our Vanity Suite by VIVA hotels and VIVA Cala Mesquida Resort. It’s packed with history and tradition. The “Castell de Capdepera” (Capdepera Castle) is the main attraction in the town and the views are so instagrammable that you’ll be more than happy to climb the steep slope to take a photo. A photo of a typical Mallorcan ensaimada pastry is a must. But, this dish is just a sample of the varied and delicious Mallorcan gastronomy. Sobrasada (smoked sausage spread), coca de patata (a typical sweet bread) or frit mallorqui (a typical dish with meat, onions, potatoes, tomatoes and peppers) are some of the dishes which will be sure to whet your appetite and grab your attention. If you’re staying at one of our Hotels VIVA hotels, we’d definitely recommend you visit Restaurante La Terrazza. Even if you don’t want to, you won’t be able to resist taking a photo of the dishes – both the presentation and the flavours make it truly special. That’s without mentioning the stunning views of Cala Mesquida you’ll be able to enjoy while tasting one of the dishes. If you’re after something more relaxed, we’ve got super buffets at our Hotels, perfect for all palates. You’ll be able to enjoy fantastic smoothies which will get you many a “like”. What are you waiting for? Grab your phone or camera and get out and about in search of Mallorca’s photogenic spots. We’d love to see the sunset on the island, the turquoise water, surprising sporting moments, its unique caves and succulent dishes on your Instagram account. It’s a great way of sharing with everyone how lucky you’ve been to see and live on the fantastic island of Mallorca.